Room 100 and the Room 200 Complex are our largest and most versatile rooms for large conferences, expos, concerts, and other events. Room 100, with an octagonal shape, offers opportunities for holding events in the round. The Room 200 Complex can be quickly converted into two or three rooms with floor-to-ceiling folding partitions. The rooms are described below. Room 100 is a large, octagonal room (3,000 sq ft) that accommodates 280 people auditorium-style and 144 people banquet-style with round or 8-ft rectangular tables. Its high, cathedral ceilings finished in cedar with a central skylight, brick interior walls, and art glass "Creation" windows combine to create a unique, modern space. The room's audio-visual system includes a house sound system, wired microphones and automated retractable projection screen. Free WiFi is available throughout the facility. An upright piano and organ are available to rent. Multiple lighting options are available with lights on dimmer switches, as well as special day and evening settings. The room also features a heated baptismal pool for full-immersion baptisms behind sliding door panels. Room 100 has direct access to the commercial kitchen for catered events. Rooms 200/201/202 (1,500 sq ft each) feature the "Genesis" art glass windows, depicting the elements of earth, air, fire, and water. 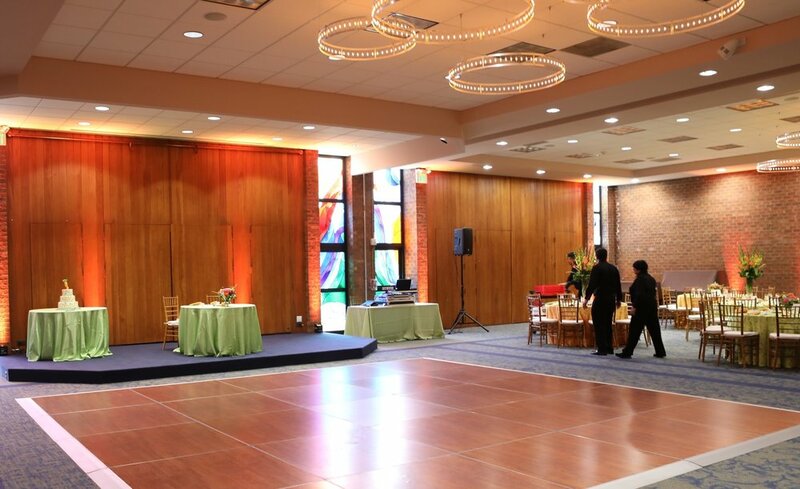 The Room 200 Complex can be configured to accommodate a variety of events. Floor-to-ceiling folding partitions divide the complex into Room 200, 201, and 202. Combination of two rooms of the Room 200 Complex permits auditorium-style seating for 264 and banquet-style seating for 128. When all three rooms are combined, our largest capacity room holds 410 auditorium-style or 250 banquet-style. The room's audio-visual system includes a house sound system, wired microphones and an automated retractable projection screen. Free WiFi is available throughout the facility. Grand and upright pianos are available at no additional charge; an organ is available for rent. Recessed and fluorescent lights on dimmer switches provide a variety of lighting options. Room 202 and the Room 200 Complex (Rooms 200, 201, and 202 without partitions) feature direct access to the commercial kitchen for catered events. Rooms 201 and 202 can be separated from Room 200 with floor-to-ceiling folding partitions. This feature of the Room 200 complex provides opportunities for a variety of functions in large, adjacent rooms. For example, a luncheon can be conveniently served to attendees of an expo or conference without breaking down the meeting space. Each room can hold 144 people auditorium-style or 64 people banquet-style.